Gary McHale, President of Canadian Advocates for Charter Equality, was the keynote speaker at the Carleton Landowners Association Property Rights Seminar on April 26th. 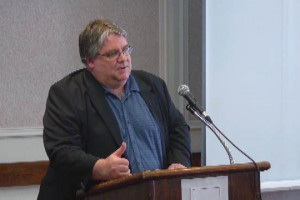 Gary spoke of Property Rights and Law and Order and how both appeared to be absent during the Grand River land dispute in Caledonia. You can see his presentation, along with others from the Seminar here. Gary has invited the Landowners to participate in a BBQ to send a message to all political parties, four days before the Provincial Election, in support of two fundamental principles: Property Rights and Law and Order. The event will take place in Caledonia starting around 2 PM on Sunday, June 8th. For more information, see the flyer or contact Gary at garymchale@shaw.ca or telephone 289-286-0423.